Control-Box® is a strong structural underground water storage module which provides large capacity water storage without the inconvenience of above ground tanks taking up valuable space. Control-Box® is designed for use under heavy traffic areas (to accommodate B-Double trucks). It is the market leader in available water storage space per cubic metre and provides excellent strength whilst remaining one of the lightest structural water storage solutions on the market.. The individual modules lock together on all sides, providing virtually infinite expandability in three dimensions, while the unique 500mm central channel provides on-site access for inspection and cleaning without dismantling the assembly (tank). The modular design offers a range of sizes from a few hundred litres to tanks of more than one million litres. Storage volumes are limited by only your requirements and available space at your location. The unique patented design provides features including integrated inspection and cleaning access via the 500mm opening at either end of each module. The system provides equal strength vertically and laterally. The modules lock together in all directions to create precision tanks assemblies of almost any size. 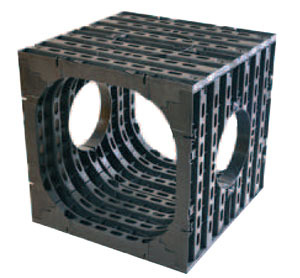 Manufactured from polypropylene plastic (recyclable), for long term compressive strength and to avoid harmful leaching. The unique modular system offers installation options. Either install by hand (module by module), or lock modules together above ground and lower sections into place (reduces handling and traffic in the pit). Accessories are provided for pipe connection and module locking to ensure installation is both efficient and precise. 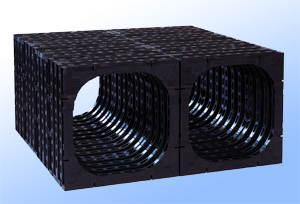 Liners are available – manufactured from 0.75mm polypropylene (prefabricated in the required shape to drop in the hole) with pre-fitted pipe-boots for superior inlet and overflow pipe connections. The Control-Box® system is delivered on pallets – either in flat-pack form (to be assembled) or fully assembled. A Control-Box® module is assembled by hand-pressing 4 identical pieces together. Modules are then locked to each other with connectors to make a precise assembly. Control-Box® has been independently tested and certified for vertical and lateral compressive strength. Testing was carried out by TUV NORD Systems GmbH & Co. KG in Hamburg, Germany. (TÜV NORD Group has expertise in nearly all questions of technical safety, environmental protection, and the conformity assessment of management systems and products – in Germany and internationally). Australian verification of the Control-Box® specifications is provided by Adelaide Engineers, PT Design – this document is available to specifiers and customers. 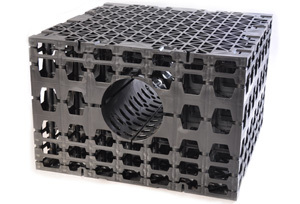 Polypropylene is used to manufacture Control-Box® as it has a known and stable polymer chain, providing the desired mechanical properties to maximise long term compressive strength. For street and pavement use. Designed to withstand heavy truck traffic.